Related Series: Deadman Wonderland OVA. Notes: Adapted from a manga written by Jinsei Kataoka and illustrated by Kazuma Kondou, published in Shōnen Ace since 2007. The good old ultra-violence, as Anthony Burgess would put it, is certainly not too uncommon in the world of animé. Elfen Lied lived on it, High School of the Dead and no one could forget about Gantz... True, it is not as common as, say, cute schoolgirl comedy but there is a certain little niche in the fandom that are regular fed and watered in the red stuff. Deadman Wonderland is for them. The most striking difference from the aforementioned 'gore hound' shows is that DW has a surprising lack of 'jiggling', something that traditionally goes with this sort of pulp - not that the 'service isn't there; there's just surprisingly little of it relatively. In any case, despite having very little interest in high violence for its own sake, I still found DW to be a decent little series, flawed but with some strong positive points that keep it afloat. It would be nice if it gets finished. Let us talk about the story. Like many of these kinds of series, being sensible and down-to-earth is not in DW's modus operandi. We have a setting where prisoners find themselves used and abused, often violently, for the amusement and satisfaction of others and there is very little subtle about it. The story unfolds pretty typically with Ganta being our bright-eyed but terminally angsty hero who finds himself imprisoned on false charges and Shiro being the mysterious albino genki girl he meets there. The stage is set early on, that Ganta is seeking to find out the truth behind the massacre of his friends and the find the means to clear his name. Super-powered action scenes punctuate the rest of the series as Ganta digs deeper (and often blockheadedly) into the mystery of Deadman Wonderland. So what's good? First of all the action is good. It is not the best animation you will ever see but the choreography is sufficiently intense and the powers used are varied and interesting. The art and design of the show certainly won't make you sneer. The character designs are immensely detailed and both hideous and pretty when appropriate, the muted colours of the prison are atmospheric and act as an effective contrast compared to the world outside and the general detail put into the environment certainly gives the prison a life of its own that many settings never manage to have. The characters too stand out. Even if he is a little whiny, Ganta is not easy to hate and is certainly moderately sympathetic. He also has enough badass moments to make up for a great deal of his whining as well as having a pretty decent excuse compared to many a dark action animé lead. Shiro is an interesting take on the mysterious girl archetype, a niche normally filled neck high with Rei-clones and other stoic stereotypes. Shiro is anything but stoic, seriously. Loud, energetic, childish and cute, even her bright white costume is at complete odds with the dark, dingy atmosphere of the series. As an aside - I have to admit that I felt rather put off by Kana Hanazawa's vocal performance since Shiro sounds exactly like a certain character from the show Fractale and also another from Blue Exorcist, both also voiced by Kana Hanazawa. Not terribly important but I just wish that animé directors would get Kana to use the vocal range that she has. Most of the negatives for the show are symptomatic of the show's genre. Most obviously, the series is DARK. Anybody who has seen Elfen Lied or its kind already know what I'm saying. Characters, as a standard, are cruel and vicious - everybody nice is faking it, every smile hides an agenda and not even puppies are safe. Ganta doesn't get any breaks either, his class get slaughtered, he gets framed for it and then its downhill from there as the whole world takes turns to kick mud in his face for the course of the series. This darkness is fine if that's what you like but the rest of us can find it a bit depressing at times, especially because it often seems to serve little purpose other than to make the show a bit darker. That said, this is not Katanagatari and there is a sense of hope in there somewhere even if it is only in Ganta's imagination and it stops the show from tipping into the oblivion of complete misery. It also helps, oddly, that DW never really takes the time to be truly affecting at an emotional level, much of the stuff that happens is too over-the-top to be taken seriously. That lack of emotionality is still a negative too, though. It's not a series I ever felt involved with or even particularly excited about on any level. It's not that it isn't interesting but I never felt that urge or even a draw to find out what's going to happen next. To be honest, sometimes it felt from the pacing that the show just wanted to get through its plot as quickly as possible and feeling like you're being dragged along is not terribly fun. I felt consistently detached from the series and when it ultimately ended with little resolution, I felt as if I should have cared more. Oh, and I repeat, don't expect a proper ending should you watch this. So yes, DW is a show of interesting ideas, great visual merit but blunders most seriously with its flawed execution. Is it bad? Not at all, and it delivers in the areas that most fans will be looking for it to but neither is it particularly good (a great OP though). A mild recommendation for genre fans but everyone else can take it or leave it. Recommended Audience: This series is extremely violent and some of the characters enjoy it greatly. That alone makes this for adults only. 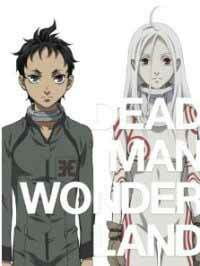 Deadman Wonderland © 2010 Jinsei Kataoka, Kazuma Kondou/Kadokawashoten/Deadman Wonder Land Ward G.